Reproduction, appropriation, and automation are three major ongoing concerns within contemporary music and art. It's strange then that relatively few people know about two mid-20th Century musical instruments that embodied all of these methods: the Chamberlin keyboard and its offshoot, the Mellotron, the first instruments built on taped samples of the sounds of others. 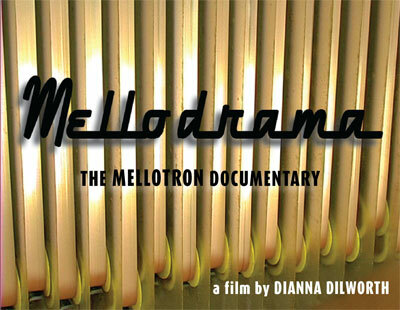 In Mellodrama: The Mellotron Documentary, filmmaker Dianna Dilworth takes measure of the many players in the story behind these unruly sound machines, whose very existence ultimately shaped much of popular music. The film is a study in the unpredictability of innovation, and how each extension of the same technology can conflict with the intentions of those that came before it. John Alderman: People often find uses for devices that are outside the inventor's original intentions, and it seems like that's what happened with these instruments. Dianna Dilworth: Absolutely. Harry Chamberlin, the man who invented it was really into playing the Hammond organ but he wanted one that would play orchestral sounds, and so he started doing experiments and working with the Lawrence Welk Orchestra to record sounds. His vision for it was very much for it to be in every living room across America for sing-a-longs and socializing. Yet it was adapted by non-conventional musicians and it took off in psychedelic and progressive rock, and that he really didn't intend. In fact, people would try to buy the instrument from him and he'd tell them, "no, no, you're supposed to use it like this." What are the most recognizable songs that feature these instruments? The most famous song is "Strawberry Fields" by the Beatles; the flute sound at the beginning is a Mellotron. On the other Beatles' song, "Bungalow Bill" there's a Spanish guitar sound at the beginning, and it's actually just a rhythm track on the Mellotron. The Moody Blues' "Nights in White Satin" has it throughout the song. It was largely associated with progressive rock, but it was used by other people like Led Zeppelin, Rolling Stones, and the Zombies. What are the differences between the Chamberlin and the Mellotron? 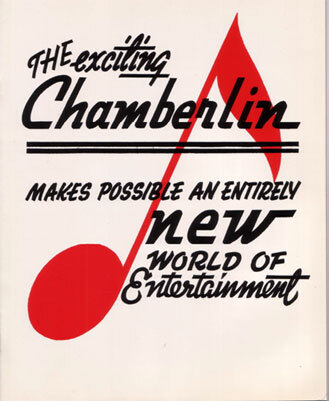 Chamberlin made the instrument in his home in Southern California, and sold it to local music shops. He had a salesmen, Bill Franson, who thought it was a really good idea, but felt he wasn't getting enough out of it, so he took the idea to England where he had it manufactured professionally, and thus was born the Mellotron. The difference between the two instruments is very interesting. The Chamberlin is kind of shoddily put together as a physical object, very homemade, but the sounds are very, very well recorded. He used a Neumann microphone and had the Lawrence Welk Orchestra record the samples. 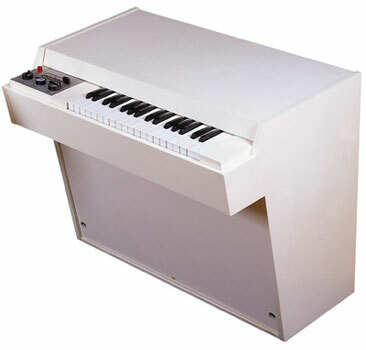 The Mellotron is very professionally made furniture, made in a factory in England, but didn't have as much effort into its sounds, so the fidelity is worse. They both, though, have very interesting, unique sounds, and neither one of them sounds like an orchestra. It's funny to look back at that, because when it came out the musician's union was concerned and tried to ban them because they were afraid that it would put people out of work. Like, "No one's going to hire a flute player for their record because they have this magic box that can make that sound." But when you hear it, it doesn't really sound anything like a flute, it's kind of a weird, warped sound that is attractive to musicians looking for something new. And people still play flutes on records. And do people still play Mellotrons? Yes, in fact they're on many records now, because musicians and producers still like them, even though there were only about 500 Chamberlins, and 2000 Mellotrons made. How have the instruments aged? They became very archaic for a time, because digital sampling came in, and synthesizers became popular, so many people abandoned them, though some kept them around at the back of their studio or whatnot. There was a movement in the late 80s. early 90s to find these instruments and use them again. But when that movement started it was pre-Web, so people found them in junk stores, whether they were fans of 70s rock music or just came across them and wanted to do something different with them. Because of that there's a scene of people who use and restore them, but they do break down a lot, so it is a constant job for them; they are now quite expensive. There's a younger generation of people who collect them, take care of them, and almost fetishize them; and then the older generation of guys who used them when they were new are just done with them. Some of them are like, "I hate the Mellotron," because they went on tour for years and they'd be waiting to perform for large audiences and then their keyboard would break and it wasn't cool, it wasn't what they were going for, they were trying to play a song. It's an interesting generational perspective. Because nowadays people will argue that when a tape gets stuck or when something breaks, they like the fact that the instrument that they're playing is kind of temperamental and has a personality, and will make these odd sounds, and they appreciate that, whereas the older generation tends to not like that at all. Aren't people selling virtual versions of these machines? Yes. Because the sound is obviously not the sound of an orchestra, it's the sound of a Mellotron or a Chamberlain, people have now put them into samples. For example, there's the M-Tron, which is a digital plug-in. And Nord-Electro, the company that makes the Clavier and other synthesizers made a sample that they've recorded from the original tapes but that can be played through their keyboards. There's a whole number of different ways that you can sample this instrument these days. And there are different schools of thought on that: some people really don't like the samples, and some really do. The main argument is that the actual instrument, because of all of the mechanics in it and the things that go wrong, that creates the sounds, and some people like the characteristics of playing through the old machines. But some of the samples have been able to emulate those things, like being able to stop midway through a note and being able to pick up where it would have left off it had been a tape in the physical mechanical object. You used a lot of footage from the public domain Prelinger Archives. How did that work? One of the challenges when telling a history is that you end up having all these talking head interviews, and that means you have to come up with ways to make it interesting for a viewer. The Prelinger Archives really helped us with that, because there are so many interesting old reels and commercials and industrial films, and they fit into the time periods we were talking about, or they gave a nice look to a sound that we were trying to highlight. The other thing was licensing, and though we were able to license some performances of music, these are big bands and we're an independent film, so being able to use a public domain collection like the Prelinger Library is nice. Looking at your career as a filmmaker, you seem to focus on the periphery phenomenon surrounding music, like your film We Are the Children, which is about Michael Jackson fans. Why did you decide to make a film about musical instruments? Two reasons really. I'm very interested in Harry Chamberlin and the idea of his homemade invention and that he made something from the materials that he had in his house, or that he could get at RadioShack. I like the spirit of the American inventor. And I also like the idea that his homemade project, that was both very inventive or a failure depending on how you look at it, that it had this kind of influence on how technology evolved. Also, most people don't know what these instruments are, but they're on so many records that the sounds they produce are very familiar. I thought it would be interesting to tell the story behind the scenes, not just in music production, but also the sub-culture that has fetishized these instruments. John Medeski is arguably one of the best current Melotron players out there. It's very prominent on the MMW album "End of the World Party" (for instance, but you hear it throughout a lot of their music).